We partnered with Zazzle and created the Six Castles t-shirts. 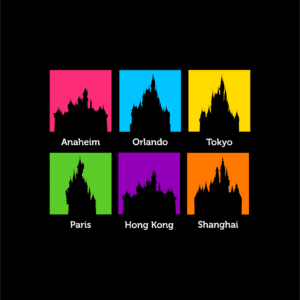 This shirt is perfect when you are a fan of visiting Disney parks, like Disney castles, love the Pop Art style, and are a member of the Six Castles Club. What is the Six Castles Club? The Six Castles club is a group of people who have visited all Disney castles around the world. 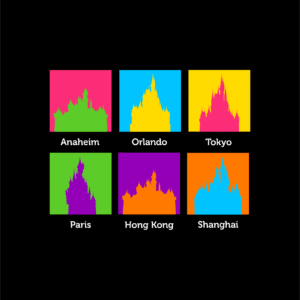 At the moment there are six different Disney Castles. Each Disney resort has one park that is home to a Disney Castle. When you wear this t-shirt, you can let people know that you are part of the Six Castles Club. 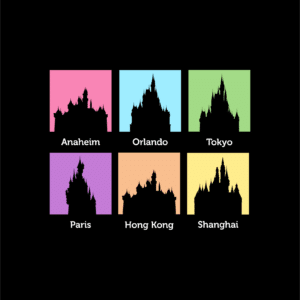 Of course, we invite you as well to order to shirt when visiting all six Disney castles is still an item on your bucket list. We visited all castles during our #DisneyRTW in early 2017. Head on over to our webshop at Zazzle. Click the country link below to make sure you get the best deal on shipping cost. Currently we have four different designs. The castles are ordered based on the year when they opened. With Anaheim being first (1955) and Shanghai being last (2016). Each design is unique but itself. At the moment we sell the following designs: Original, Offset, Shadow and Pastel (women only). Click the country flag above to get the best deal on shipping cost.